Jambi is another province settled in Sumatra Island, which properly located on the east coast of central Sumatra. The capital of this province is Jambi city. At early begin, before Indonesia colonized by the Dutch colonial Jambi was a part of well-established of Srivijayan Kingdom. 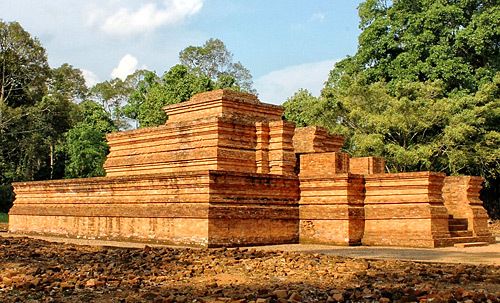 Srivijayan kingdom was an ancient Malay kingdom in Sumatra. It gained its influence some time in 7th century but rather overshadowed by the large neighbor kingdom that time, namely Sriwijaya. Melayu then became a subject of Sriwijaya and then Sriwijaya fell, Majapahit took over this kingdom. Then Minangkabau people of West Sumatra claimed this area after the fall of Majapahit. In 17th century, the Dutch East India Company created an alliance with Sultan Muhammed Nakhruddin. The Dutch then monopolized pepper trade in this area. Later on 1901, Dutch East India Company moved its place to Palembang in South Sumatra and Jambi was free of its influences then. The people in Jambi is dominated by the ethnic of Malay with the group of Kerinci and Minangkabau. The economic site from this province is mostly come from Jambi city as the capital of this province. The busy spot from Jambi city is on Batang Hari river as an oil and rubber-producer center. Mount and Lake Kerinci is commonly visited by the tourist while they passing by to Jambi. The existance of flora and fauna in Jambi, makes this city own their particular of national park as a reservation for those habitats, and others tourism destination are Kerinci Seblat National Park, Bukit Tiga Puluh National Park, and Barbak National Park. Every day, there are 6 flights departing and arriving at Jambi. Flights from Jakarta would have spent one hour, 15 minutes from Palembang and an hour from Batam, as well as from Singapore. Travelling by ship or ferry is also easy, from Batam it only takes 5 hours and 7 hours from Malaysia. To see and feel the road trip, it takes 6 hours from Palembang, 8 hours from Padang and 10 hours from Bengkulu.